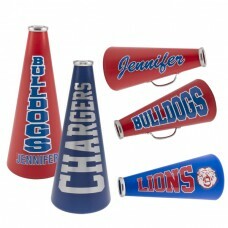 These megaphone decals are custom made in your team colors and your team name. 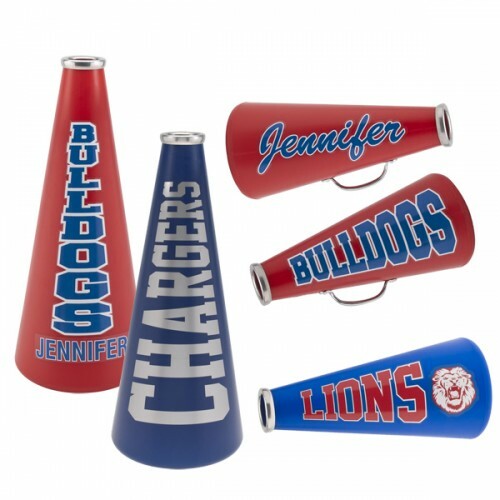 Choose a size, a font, a lettering style and a mascot, and we will do the rest. Made of durable, water and fade resistant material for long-lasting outdoor use. Please indicate a position and lettering style when ordering. Please Note: Megaphones and decals must be ordered separately. These are custom made for you and are not able to be returned or exchanged for any reason. Decals are printed in four color process inks and not Pantone colors on white material. Neon and spot colors are not available. Letters can be cut from metallic silver and metallic gold material but, cannot be printed.